After lying on the bottom of Lake Mead for more than 55 years this exciting dive site is open again for divers to see. Since the discovery of the sunken B-29 Bomber in Lake Mead in August 2002 the wreck site has fallen under a Special Diving Restriction preventing visitation by the general public. This is not an undue hardship to the general public as this site has / had significant historical importance and has been designated a submerged cultural resource. The Lake Mead National Recreation Area has been designated as the custodian of the B-29 and all of its appurtenances. 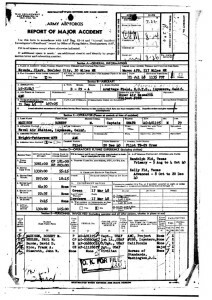 The National Park Service has documented the wreck site and have conducted appropriate archeological studies on the site including measurement surveys, documentation with both still and video imaging. They have determined that the site is stable and not under imminent danger of destruction by the elements. 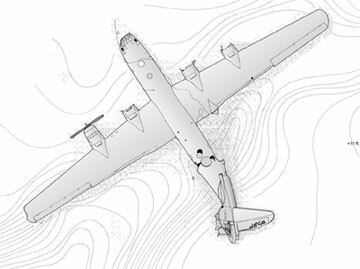 Considering that archeological and documentation have been completed the National Park Service has opened the wreck site of the B-29 so that qualified individuals can visit the dive site with trained escorts. The National Park Service recently selected Scuba Training and Technology Inc. (Tech Diving Limited) as the exclusive company authorized to conduct Guided Dives on the B-29. This is STT/TDL’s third permit, they previously had permits in 2007 and 2008. The B-29 Superfortress is a four-engine propeller-driven heavy bomber designed by Boeing that was flown primarily by the United States toward the end of World War II and during the Korean War. It was one of the largest aircraft to have seen service during World War II and a very advanced bomber for its time, with features such as a pressurized cabin, an electronic fire-control system, and a quartet of remote-controlled machine-gun turrets operated by the fire-control system in addition to its defensive tail gun installation. The name “Superfortress” was derived from that of its well-known predecessor, the B-17 Flying Fortress. Although designed as a high-altitude strategic bomber, and initially used in this role against the Empire of Japan, these attacks proved to be disappointing; as a result the B-29 became the primary aircraft used in the American firebombing campaign, and was used extensively in low-altitude night-time incendiary bombing missions. One of the B-29’s final roles during World War II was carrying out the atomic bomb attacks on Hiroshima and Nagasaki. Due to the B-29’s highly advanced design for its time, unlike many other World War II-era bombers, the Superfortress remained in service long after the war ended, with a few even being employed as flying television transmitters for the Stratovision company. The B-29 served in various roles throughout the 1950s. The Royal Air Force flew the B-29 and used the name Washington for the type, replacing them in 1953 with the Canberra jet bomber, and the Soviet Union produced an unlicensed reverse-engineered copy as the Tupolev Tu-4. The B-29 was the progenitor of a series of Boeing-built bombers, transports, tankers, reconnaissance aircraft and trainers including the B-50 Superfortress (the first aircraft to fly around the world non-stop) which was essentially a re-engined B-29. The type was finally retired in the early 1960s, with 3,970 aircraft in all built. While dozens of B-29s have survived through today as static displays, only one, Fifi, remains on active flying status. On 13 September 1945, “Lake Mead’s B-29,” serial number 45-21847, was put into service. In 1947 it was stripped of armaments, re-classified as a reconnaissance B-29 (F-13), and moved into the Upper Atmosphere Research Project. The purpose of this project was to develop an intercontinental ballistic missile guidance system that used the sun for direction and positioning. The system was known as “Sun Tracker” and to test it a plane capable of high altitude flight followed by a rapid low level flight was needed. The B-29 was a useful test platform as it was the first mass-produced aircraft with a pressurized cockpit and after WWII there were many surplus B-29s available. On 21 July 1948 after completing a run to 30,000 feet (9,100 m) east of Lake Mead, Captain Robert M. Madison and the crew began a descent and leveled out just over 300 feet (91 m) above the surface of Lake Mead. The crew described the lake as looking like a mirror, with the sun reflecting brightly off the surface. These conditions make judging height above a surface considerably more difficult. The aircraft then slowly began to descend below 100 ft (30 m) until it struck the surface at 250 mph (400 km/h) and started skipping along it. Three of the aircraft’s four engines were ripped from its wings and the fourth burst into flames. The aircraft managed to gain around 250 ft (76 m) but then settled back onto the water’s surface in a nose-up attitude and slowly skiing to a stop. The five-man crew then evacuated into two liferafts and watched the aircraft sink. The crew was rescued from the lake six hours later and was instructed not to disclose any details of the flight, its mission or its loss. As the mission was classified, these details were not released until fifty years later. 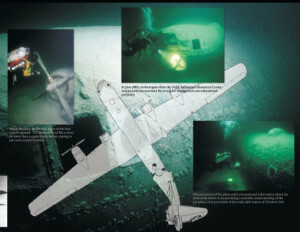 In 2001, a private dive team searching for the B-29 using sidescan sonar found the wreck in the northern arm of Lake Mead. Because the bomber lay inside a National Recreation Area, responsibility for the site fell to the National Park Service. Scuba Training and Technology Inc. (Tech Diving Limited) holds the exclusive authorization to conduct guided dives on the B-29. To make your dive reservation visit this link.